The Public Facilities District and Spokane Sports Commission gave it a hard sell, but in the end, not even those carrying the Albi name could convince the Spokane Public Schools board to move on from the Joe Albi stadium location. The Spokane Public Schools Board of Directors voted 4-1 last night to build a new, smaller football stadium where Joe Albi currently resides in northwest Spokane, after Albi is demolished. It's consistent with the advisory vote in the November election, which saw 64 percent of city voters reject a stadium downtown by the Spokane Arena. For James Albi, related to Joe Albi, the school board's vote was a huge mistake. Albi spoke last night at the board meeting in an effort to convince the school board to look into using the soon-to-be constructed Sportsplex downtown as a stadium for high school sports. "I feel that the Albi Stadium rebuilt at the present site — it will be for soccer and football — but it will still sit there a lot," he argued. "And this multipurpose idea is phenomenal." 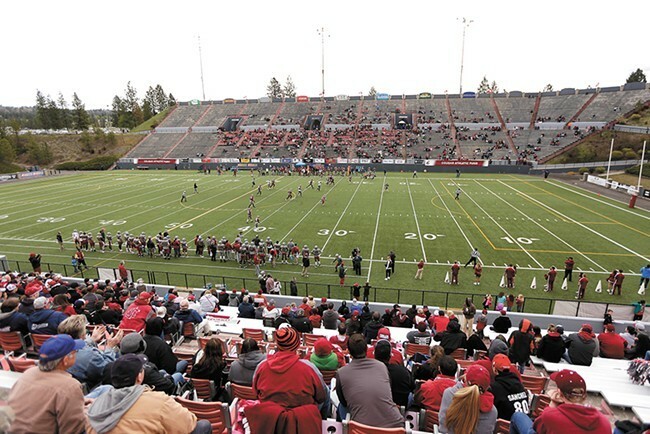 The idea, as presented by the PFD and Spokane Sports Commission, was to build the Sportsplex a little bigger so that it can be converted into an indoor football stadium when needed. They called this a "third option" that voters didn't get to vote on, since the idea for a downtown stadium up until the election was for a 5,000-seat stadium next to the Sportsplex, not a part of it. James Albi called Albi Stadium — which years ago hosted concerts and Washington State University football games — "what's good about Spokane" and "part of Spokane's heart and soul." But the aging stadium is being demolished as part of the school district's plan to build more middle schools, and Albi says the downtown Sportsplex idea was the best idea for the future. "You have an opportunity, a wonderful opportunity to create another 70-year legacy about what's good about Spokane," he said, as the timer for his three-minute public comment period rang. Deana Brower, the one vote against moving forward with building the new stadium at the current Albi location, argued more time was needed to look at the Sportsplex idea. Of the four votes in favor, three had expressed some kind of support for the downtown stadium. Jerrall Haynes said he supported the downtown stadium "until election night," but he argued that not going forward with what the voters wanted would make the board lose public trust. Brian Newberry said he wished he saw the Sportsplex proposal six months ago. Michael Wiser said the voters never got to vote on the Sportsplex idea and wanted to look into it further. But board President Sue Chapin, who has long been skeptical of any downtown stadium proposal, said the message from voters was clear. The $495 million school bond passed with the highest approval in history, she said, and it gave the district the dollars to build the new stadium. "And they also told us where they want it built," Chapin said. The PFD and sports commission argued combining the football stadium and Sportsplex would solve any parking concerns, since extra Spokane Arena parking would still be available. And they said it would save money, since it would be one building instead of two. Yet Chapin said it's not enough money to lose the trust of the voters. "I can't support continuing to investigate a project that I believe voters have already rejected," she said. Construction on the $42 million Sportsplex, meanwhile, should start in spring. It will have space for 17 volleyball courts, 10 basketball courts, 21 wrestling mats and it will feature a 200-meter indoor hydraulic-banked track. Just not enough space for a football stadium.